FARGO, N.D. - Robert Jurkowski, TACOM Life Cycle Management Command Armament Readiness Team leader and pending graduate of North Dakota State University's Master of Military Logistics program, was recently awarded the MML program's 2007 Hagen Excellence Award in Fargo, N.D. The Hagen Excellence Award is named in honor of 1st Lt. Loren D. Hagen, a past Fargo, N.D., resident, NDSU student, and Medal of Honor recipient for his heroic service in Vietnam. "I'm honored and very humbled to have received this award, given the high quality of Army officers and civilians in our class," said Jurkowski. "It's been a great opportunity to go through this learning experience with these amazing people." Jurkowski's MML class voted for him as the first MML Hagen Award recipient. The Hagen Excellence Award recognizes an individual who demonstrates a comprehensive integrated knowledge of logistics and transportation and serves as a role model to others in all areas of academics and professional excellence. 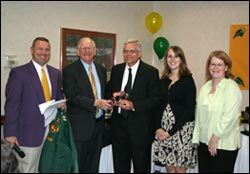 Armaments Readiness Team leader Robert Jurkowski, center, receives the 2007 Hagen Excellence Award from North Dakota State University president Joseph Chapman at the Master of Military Logistics graduation party in Fargo, N.D. Also pictured are MML Program Manager Dr. Brian Kalk; Mr. Jurkowski's step daughter, Chelsea Grillot; and his wife, Peggy.